Italy’s Mount Etna sent lava and gas shooting toward the stars early this morning (Feb. 19), the first big eruption for the volcano in 2013. 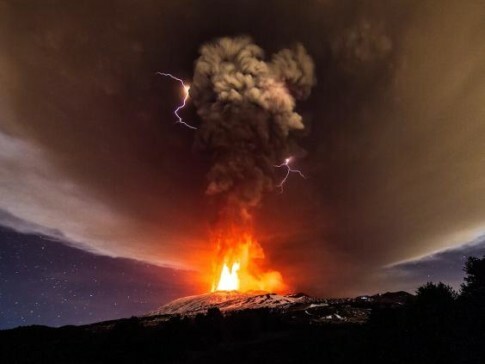 The famous Sicilian volcano burst to life overnight, sending a fountain of fire into the air. The dramatic scene was captured in a video by Klaus Dorschfeldt, a videographer and webmaster at Italy’s National Institute of Geophysics and Volcanology. The eruptions that have shaken the Mount Etna volcano on the southern Italian island of Sicily have subsided, experts said Sunday at the Palermo Geophysics and Volcanology Institute.The eruptions, which started Saturday afternoon, died away towards 9:30 p.m. (1930 GMT) the same evening. “Seismic activity has returned to normal,” a technician told AFP. The eruption, accompanied by streams of lava, had started between 3 and 4:00 p.m. local time on the volcano’s southeast crater. The last eruption of Mount Etna was in November last year, two months after another eruption forced a temporary closure of nearby Catania airport due to flying lava and clouds of ash. The last truly spectacular eruption was in the summer of 2001.